Salty and sweet or sweet and savory. Whether it be fireside in the middle of winter or by the pool in the summer, sometimes you cannot resist the urge to fall off the wagon and snack late at night. You go to the fridge or pantry and pull out a snack before bedtime. But were you aware the wrong foods can cause a disruption in your sleep? Let’s look at the reasons why snacking can affect your sleep, what foods work best, and foods to avoid. When is the best time to snack? By now you should know calories or calories either at breakfast, noon, or night. The difference is the timing. During the daytime, you have the opportunity to digest the food so your stomach is not working as hard when it needs to rest. It also is more common to gain weight when you binge at night. Your daytime routine can include a brisk walk, a run, or another form of exercise to turn your caloric intake from positive to balanced. High-calorie snacks like chips, sweets, ice cream, cookies, or creamy dips increase body fat due to the quantity you consume when tired or stressed in the evening. Quality is what matters if you cannot avoid a nighttime treat. Try stocking the fridge with string cheese or carrots for the calories or crunch. According to Very Well Health, eating your last meal or snack 2 to 3 hours allows proper digestion for food to move to the small intestine preventing insomnia and heartburn. In general, it is recommended that you wait for 2 to 3 hours between your last meal and bedtime. This allows digestion to occur and the contents of your stomach to move into your small intestine. 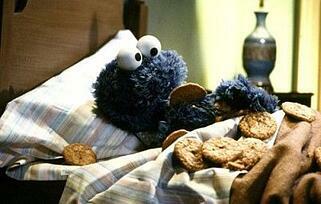 Insomnia is another symptom of late night eating or snacking too early to bedtime. Spicy and acidic foods like citrus and tomatoes along with alcohol, chocolate, and even peppermint may worsen heartburn and reflux. In addition, caffeine in coffee, tea, soft drinks, energy drinks, and chocolate should be avoided. The best snacks for bedtime. Dietitian Mary Hartley recommends a max caloric intake of 200 to avoid insomnia and heartburn or reflux. So what is the best option for bedside snacks? Start with some foods with tryptophan which is an "essential amino acid that serves several important purposes, like nitrogen balance in adults and growth in infants. It also creates niacin, which is essential in creating the neurotransmitter serotonin." As a strong source of protein, cottage cheese helps create the sleep-promoting amino acid tryptophan. Kiwi is a super fruit that provided longer sleep times possibly because its antioxidants may regulate neurotransmitters that control deep sleep. Celery is known to alleviate acid reflux and as a source of potassium aids in muscle relaxation. Hummus contains protein and complex carbohydrates that will keep you full longer and helps stabilize blood sugar levels while you sleep. Popcorn without butter but with sprinkled parmesan can be a nice, light snack at night. Parmesan also contains tryptophan that combined with the carbohydrates in popcorn can help aid your craving and won't affect sleep. Greek yogurt not only contains calcium and magnesium which is important for electrolyte balance, but contains potassium for muscle relaxation. With probiotics, it is also easy on the tummy. Ham and cheese roll up without bread provides the tryptophan and protein to improve a restful sleep and improve metabolism the following day, according to a study in the British Journal of Nutrition. Walnuts have been proven to not only increase levels in your blood but contains melatonin. A word of caution: only eat a handful as they are a higher calorie snack. Peanut butter is a popular choice at any time of the day that sticks with you longer. Add it on some whole wheat toast and sliced banana, you have a healthy, potassium-carb-rich snack. If you cannot eat peanut butter, try any other butter like almond or sunflower. Ginger is notorious for being a digestive aid and drinking it before bedtime as a caffeine-free herbal tea sets your body up for success ritual. By triggering the brain with the calming sleep aid of ginger tea, you are turning the body off and the body on for a full night sleep. Coffee should not be a surprise but the caffeine alone will keep you up at night. Save it for the morning. Soft drinks, water, juice, and other liquids will have you running to the bathroom at night. Keep the amount limited and stick to an herbal tea or warm milk. Adult beverages are a natural sedative but will lead you feeling dehydrated since your body metabolizes alcohol at a faster speed. Stop two hours before you plan to hit the hay. Steak and other red meats can raise your cholesterol and increase your risk for obesity. 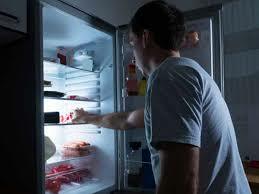 And at night, these fatty foods take longer to digest making your body work hard as you try to sleep. Bacon releases norepinephrine, a brain stimulant, so ease up on foods with tyramine. Chocolate is a go-to snack in my house but it does not mean it is the best for a sweet tooth craving at bedtime. The darker the chocolate the more caffeine it contains so watch the intake close to bedtime. Spicy food like wings or salsa are best left for lunch and possibly dinner. Depending on your body's sensitivity, spicy food can cause acid reflux or indigestion that follows you into the wee hours of the night. If you find yourself still fighting issues with sleep deprivation or restless nights after taking these tips, your problem could be deeper with a sleep condition. Our sleep specialists can help diagnose your issues to bring better sleep to the bedroom.